Anybody on here got any involvement in this ? I see that they are advertising a model display - same question ? I could bring the Rosie Maxi and Cortina. I have just booked a flight from Dublin to Birmingham return for approx €60 and a hire car for £10 if anyone cares to join me. 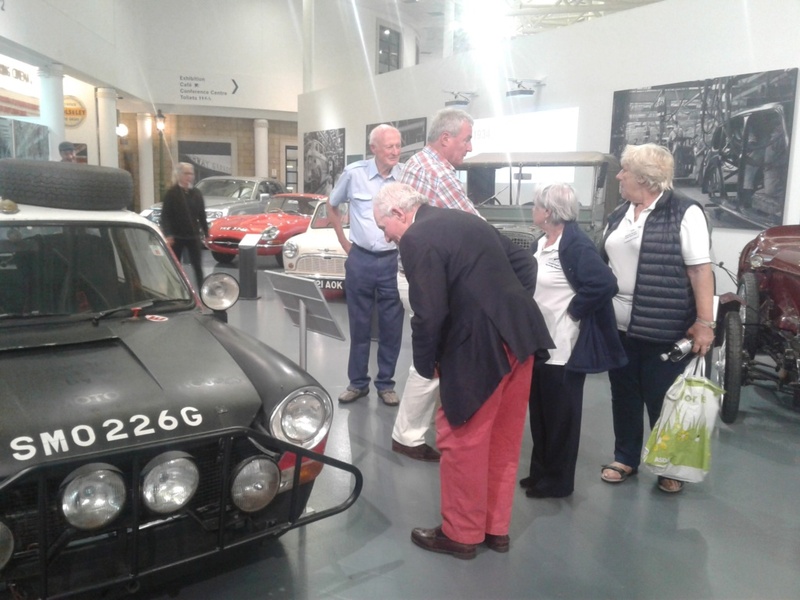 if this sort of thing interests you James, happy to lend you a book written by Eric Jackson who specialised in a lot of the long distance rallies of that era. fascinating read - not often you read a rally book which mentions cannibals! 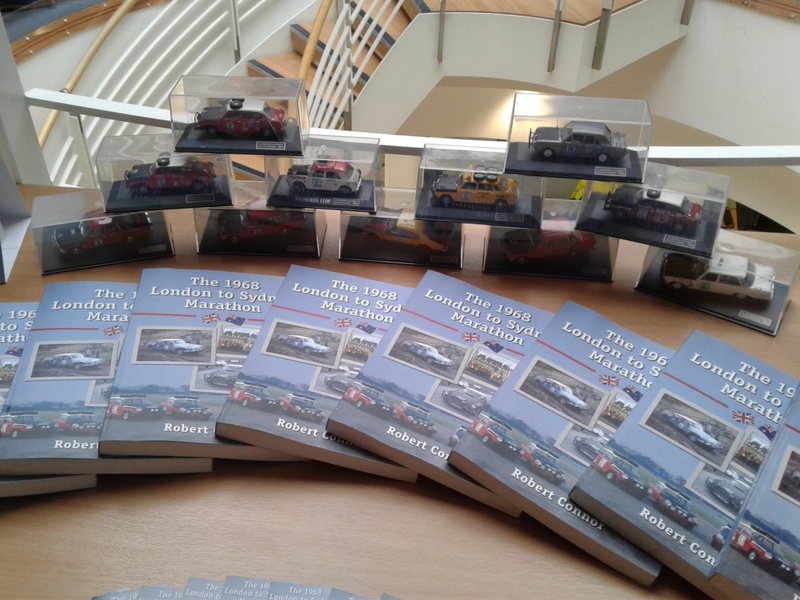 reeft1 wrote: if this sort of thing interests you James, happy to lend you a book written by Eric Jackson who specialised in a lot of the long distance rallies of that era. fascinating read - not often you read a rally book which mentions cannibals! 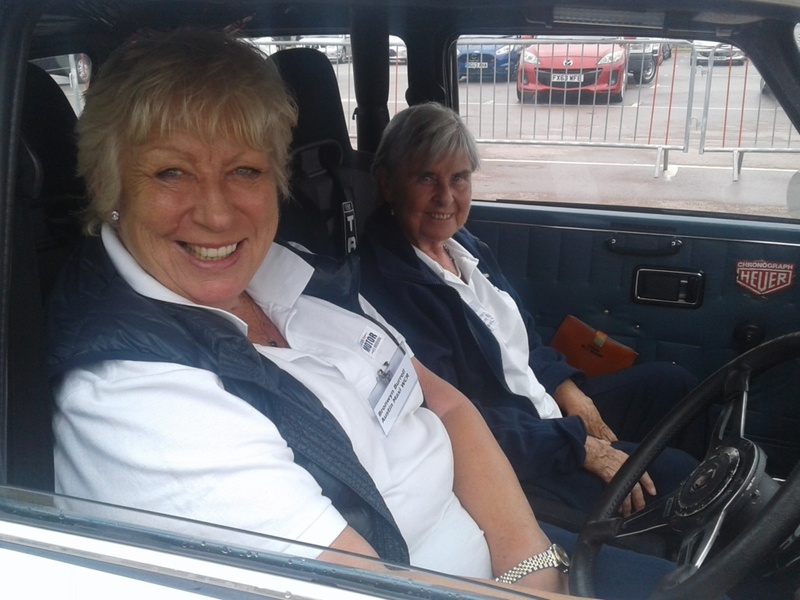 Thanks Paul - a combination of competing in Conor Falveys 911 at various events, researching models for various displays and specifically the Rosemary Smith models have gotten me interested in rally history . Whats the name of the book ? Being the magpie that I am I have built a modest rally book library. Yes I am part of the model display. 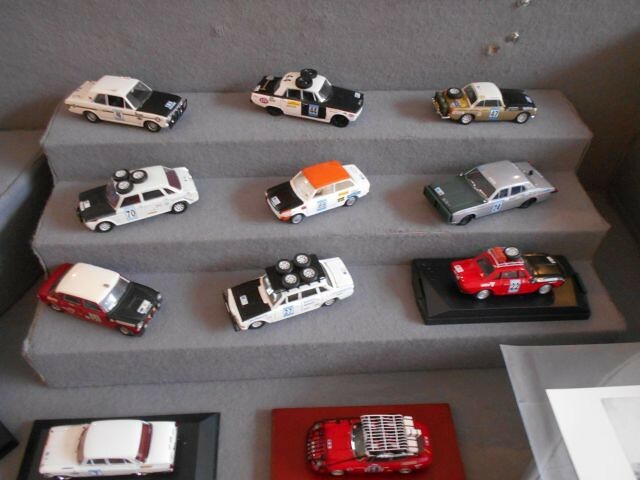 You might remember the collection of World Cup Rally models I featured on this forum a few years ago. 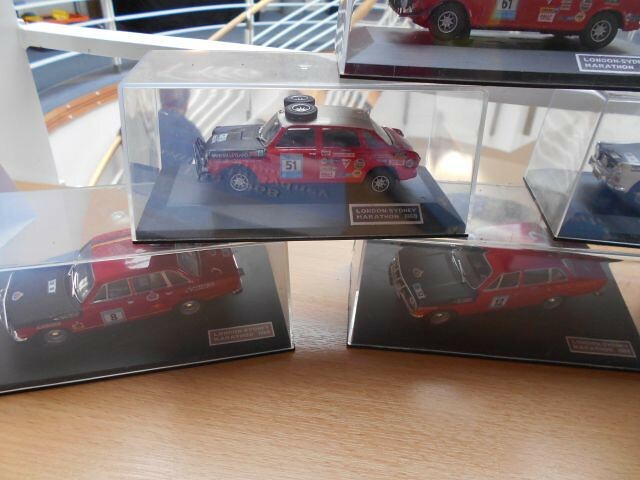 Well they belong to Andrew Bradbury and they will be on display. I was going along as a punter, but have been asked in the last few weeks to put on a display. 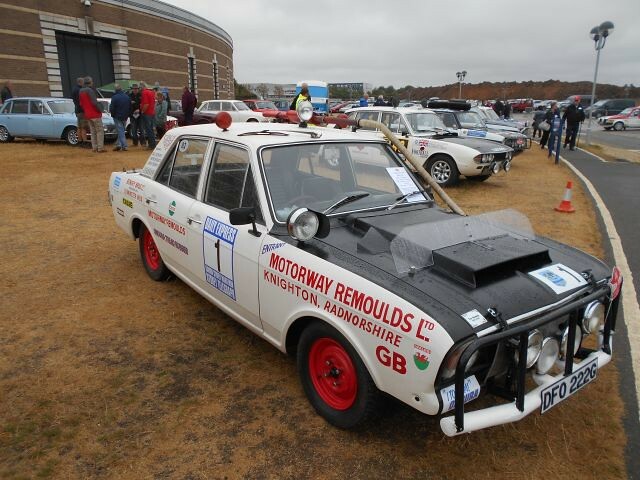 Some of you might have known Gordon Jarvis who owned a replica London Sydney Hillman Hunter. Sadly Gordon passed away very suddenly a few weeks ago. 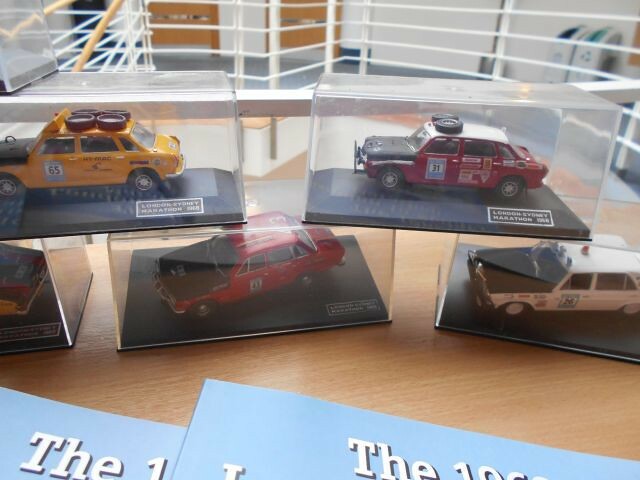 Gordon was a Rootes man through and through, so Andrew has asked if I can put on a Rootes Competition model display by way of a tribute to Gordon. 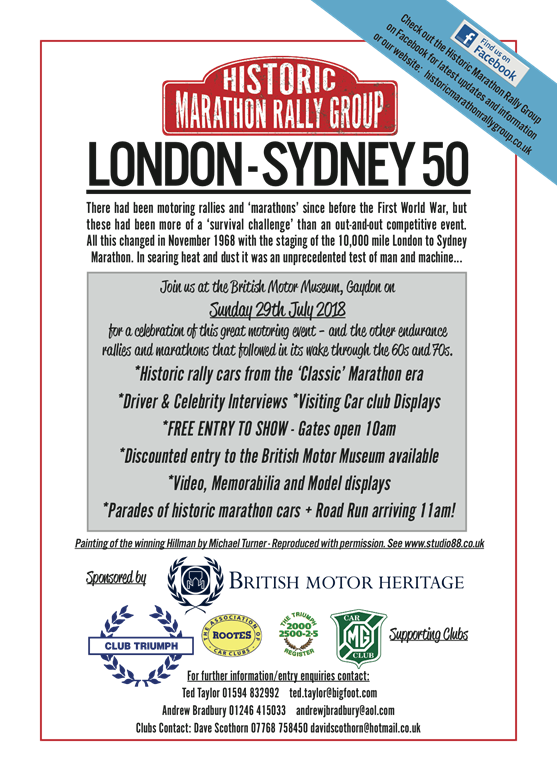 I understand that they will be quite a few genuine LS and WCR cars on display. Also that Andrew Cowan will not be there, but hopefully there all Hunter will be. I will try and find out a bit more info. If you want any rally books let me know and I can bring them up to the show. I will have a few LS & WCR related books and other related items for sale at the show. There is a softback book about the London Sydney Marathon. Its on ebay regularly from the author. I have not seen one in the flesh, to say if its any good. 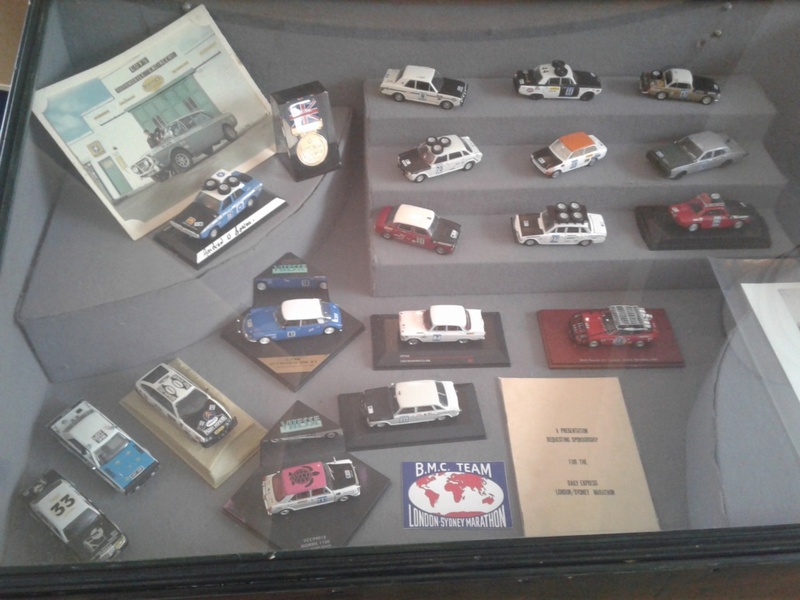 It had been my intention to put on a small Rootes display in Gowran but I have changed to a somewhat larger M3 display. 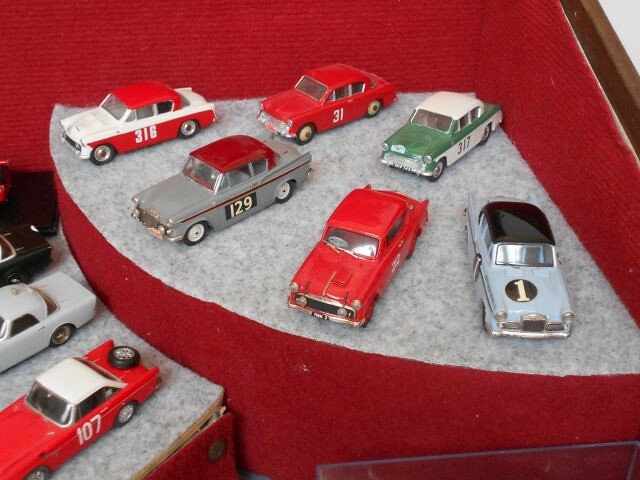 I might put up a list here of the Rootes models I have and if some are of interest for your display then I can bring them over. I have an early flight over and a late flight back so any models I may bring should be there for most of the day. I think I will be OK. 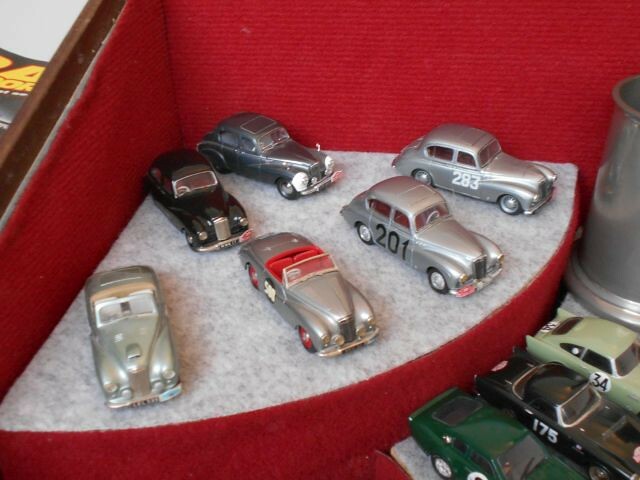 I will have some 50s Sunbeams saloons & Alpines, then some Rapiers race & rally, series Alpines race & rally, Imps race & rally, the LS Hunter, and finish with some Lotus Sunbeams. 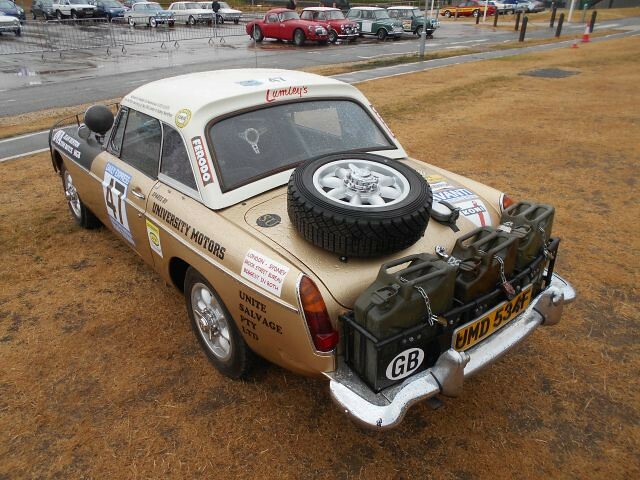 Off the top of my head, an Avenger, COI Hillman Hunter, Sunbeam Tiger (and alpine) possibly a stiletto. I will pass on the offer but I have passed the link onto a few others. 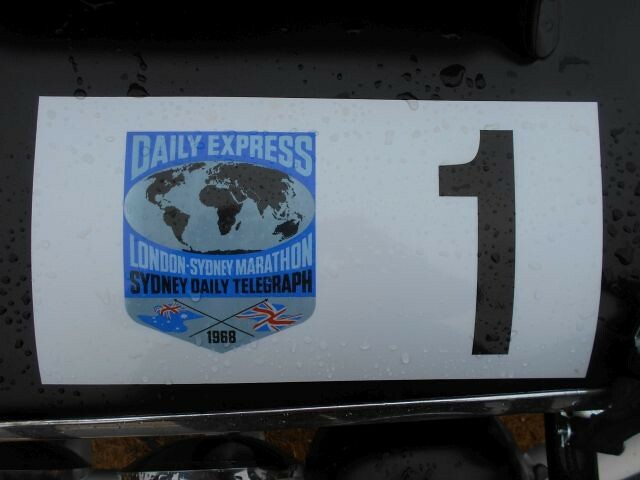 There are a few books that have been produced over the years on the '68 London to Sydney marathon. The last is only a recent print so should still be available new. The others were printed in the late '60s early '70s. and know doubt a few more!!?? 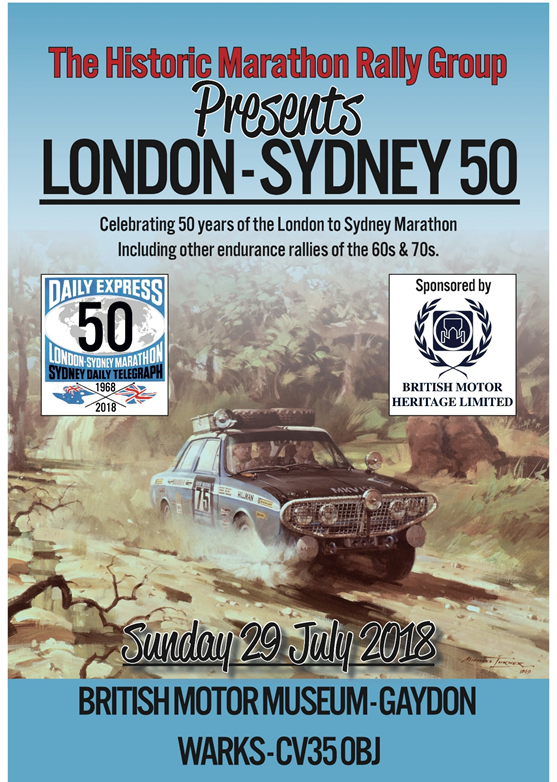 On Sunday 29th July at the Heritage Motor Museum at Gaydon, Warwickshire rally fans gathered for this 50th Anniversary of the London to Sydney Marathon. After weeks of very hot weather in the UK the day of the show was wet and cooler, but it didn’t dampen everyone’s enthusiasm. Outside were some genuine cars along with some replicas. 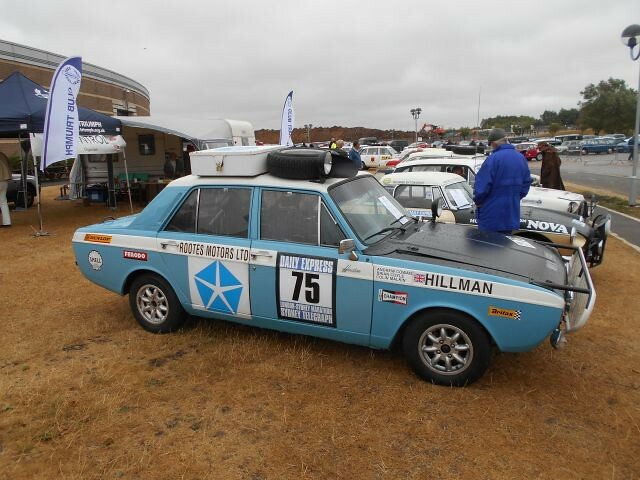 For various reasons Andrew Cowan and the actual winning Hillman Hunter were not available. Inside Andy B was there with the beginnings of a London Sydney Marathon Collection. 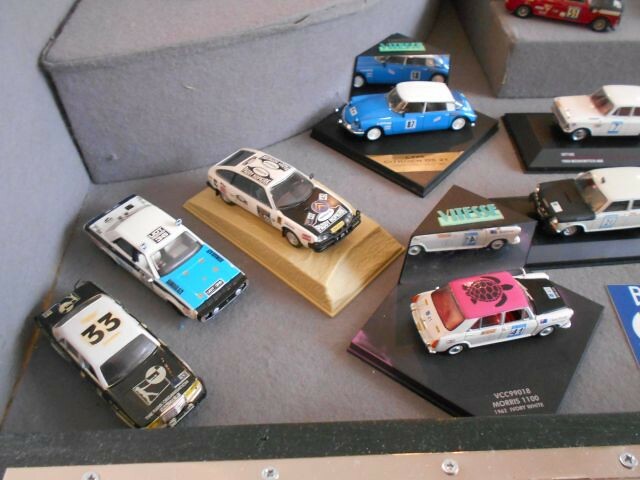 Like his huge World Cup Rally model collection many of these models are one off creations. 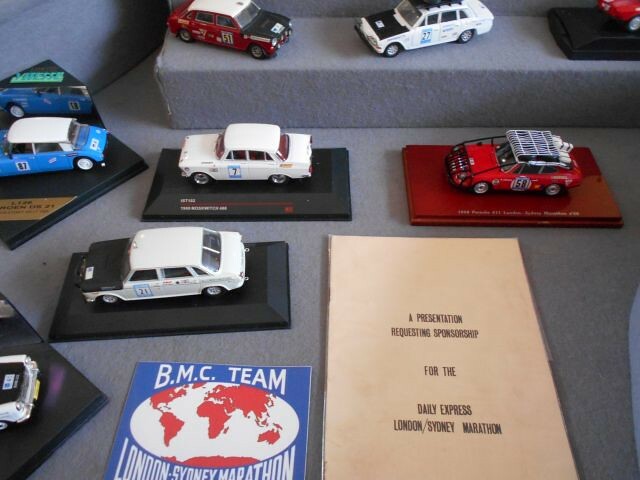 Robert Connor author of the London to Sydney book had some LS models made for him by someone I didn’t find out who? 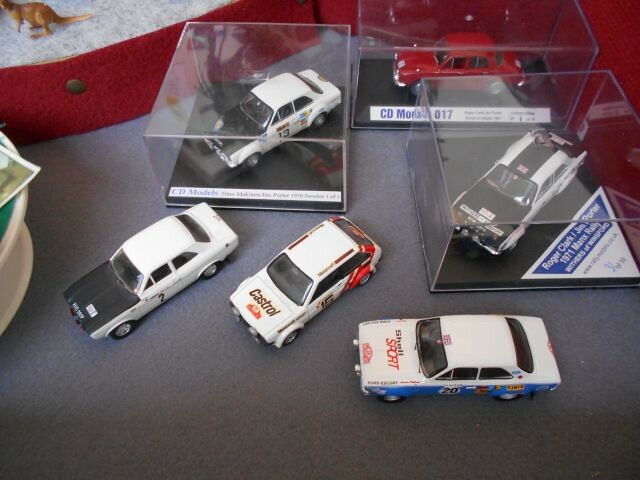 I was originally going to put on some rally collection but was then asked if I could do a Rootes display. 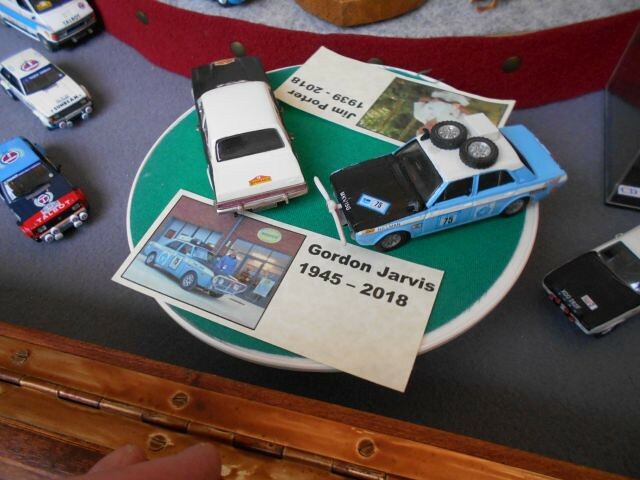 Gordon Jarvis one of the organising team for the show passed away recently. 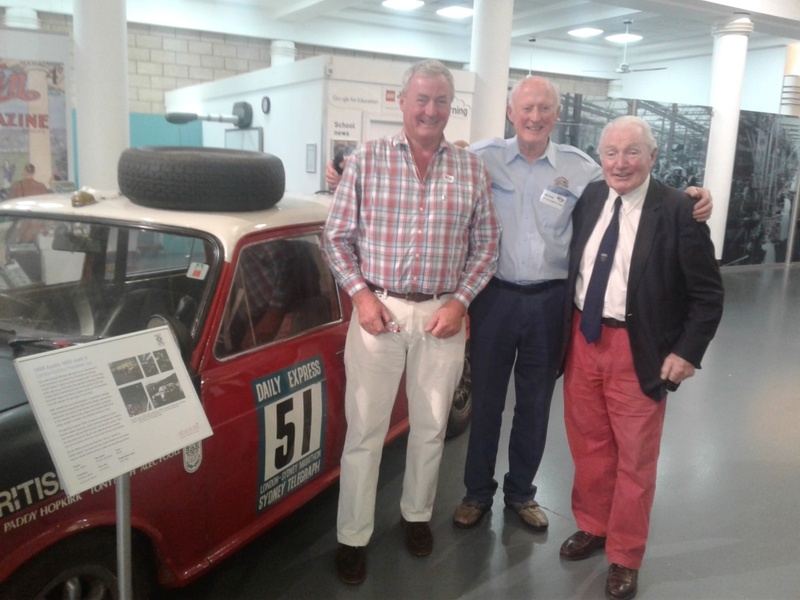 I knew Gordon as a fanatical Rootes man mainly for the Arrows cars, for preparing Richard Burns first rally cars and for his faithful replica of the LS winning Hillman Hunter. 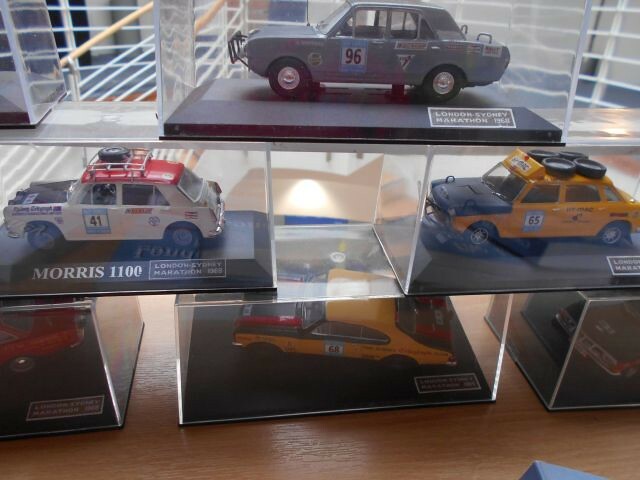 So, my display covered the Rootes from the 1950s up to Lotus Sunbeams. 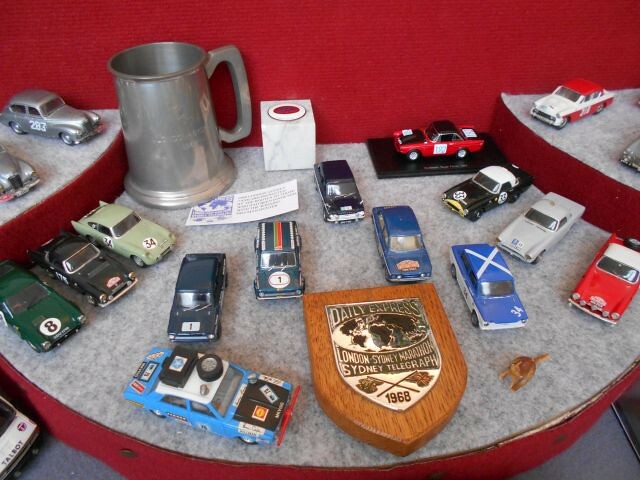 The tankard at the back was issued by the Rootes and given to all members of the winning Hillman Hunter team. At the front a finishers plaque. The Corgi Toys Hillman Hunter a superb model in its day, but completely wrong!! The one on the turntable although not finished is more like it. Thanks Chris for the insight of the day, albeit with some sad undertones. Beautiful display. Congrats and well done. Great to catch up again. I will post some photos later but most will be copies of your excellent pics. I had never been to Gaydon before which houses upwards of 400/500 British made cars from all eras - albeit with a remarkable paucity of Rolls Royces !! The venue was excellent and the show was fantastic. Crowds were small by the standards of a Vintage/car show but the huge advantage was that the attendance were mainly elderly (I felt like a younfella in their company) and so there was no issue with crowd barriers and restricting access to the displays. In fact one had unfettered access to scrapbooks of press cuttings, personal photo albums etc. There was none of the Sunday outing brigade which we have here - Mammy, Daddy, buggy, dog and assorted screaming/bored/cross/spoilt kids. 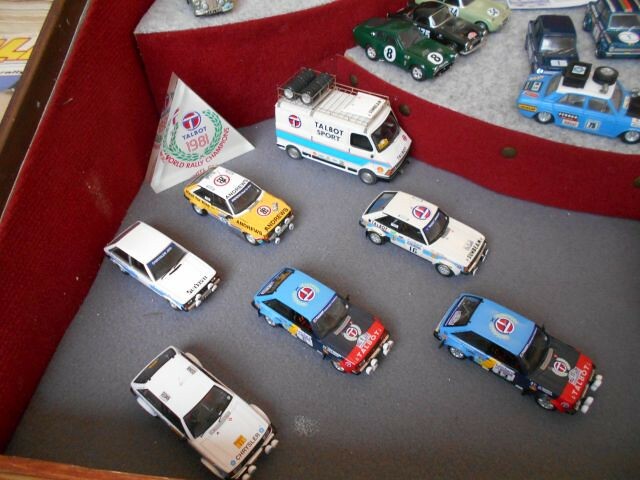 The marathon cars were outside and one had full access to the museum. 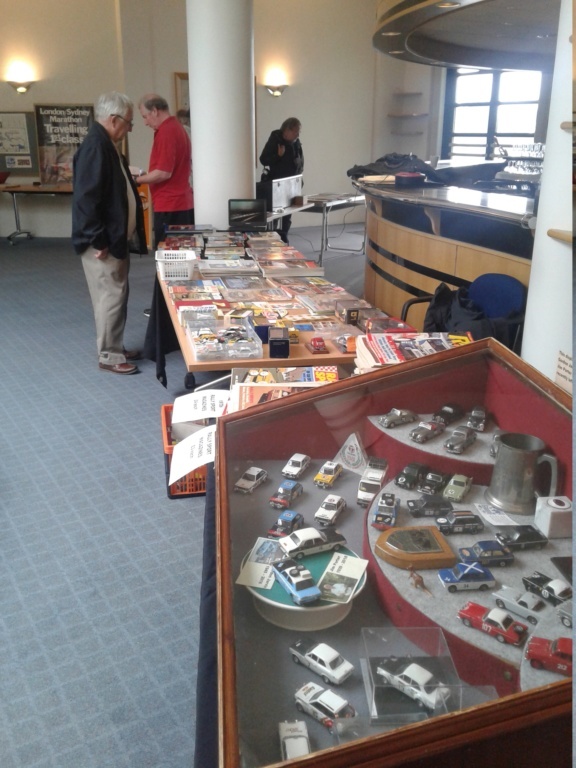 On the top floor of the museum building was Chris and his display as well as a large meeting room in which various motorsport personalities were interviewed. 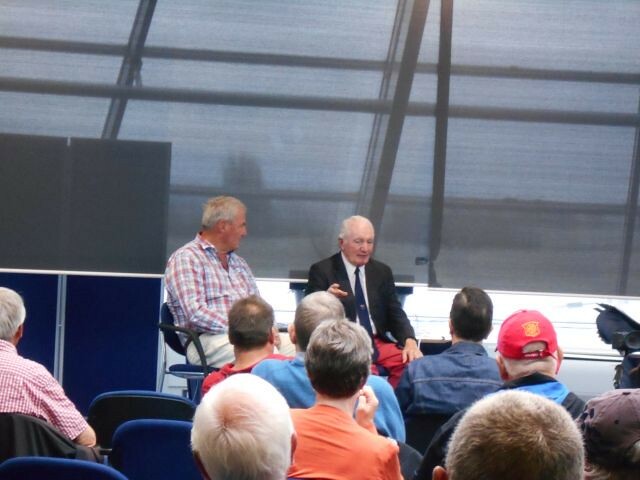 This was fascinating for me - Paddy Hopkirk, Alec Poole,Brian Culceth, Mike Wood,Bill Price, Barry "Whizzo" Williams etc. Robert Connor was also there with some models, selling and autographing his book - The 1968 London to Sydney Marathon. Somehow I think we have only ever been told a very heavily sanitised/edited version of what went on during that event, particularly on that boat journey from India to Australia. I'm afraid I was completely cream crackered by the time the show was winding down as I had been up since midnight to catch the early morning flight from Dublin to Birmingham. 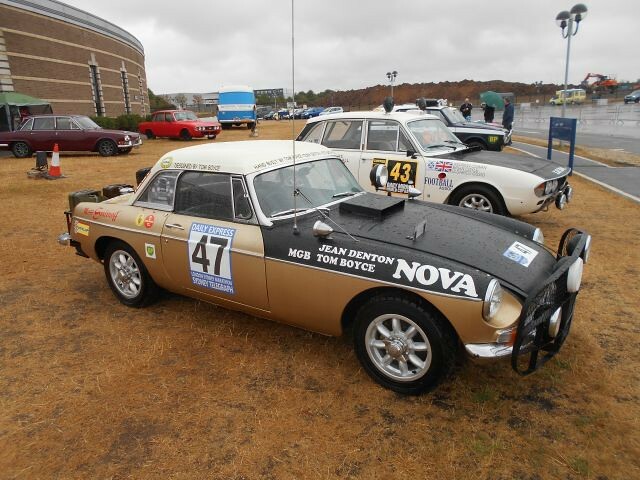 My day finished off with a brief visit to see a car in which I hope to do some rallies later in the year. Again my congrats Chris as I do have an insight into the effort involved in staging a display such as you did. Superb display Chris. Shame on the sad news but they would of been proud. Great displays as expected. 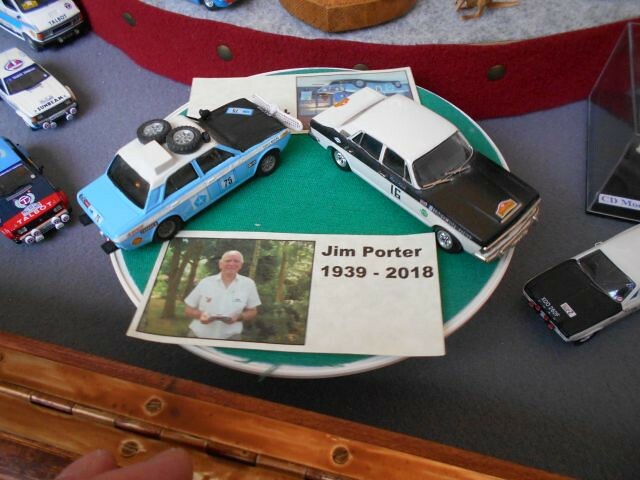 Andrew has fantastic collection of those cars still not seen them myself. Well done all involved. Just finished my last project for the Rallyday display.